Mohsin Charania has ended 2014 in style by becoming the latest double-winner on the World Poker Tour. Last year's WPT Paris winner outlasted a 586-runner field at the Bellagio over the weekend to walk away with the WPT Five Diamond Poker Classic title. The 29-year-old worked his way through a final table that included Tobias Reinkemeier, Ryan Fee, Ryan Julius and start of day chip leader Brett Shaffer but was very much the underdog at the start of heads-up play. Garrett Greer had a nine-to-one lead when play went two-handed but with the poker gods smiling in his direction, Charania doubled up on no fewer than five occasions! The fifth and final double-up was a classic flip. Charania's pocket threes held on against Greer's AK to give him an unassailable advantage. Just three hands later the Illinois native was celebrating a second Tour title and a massive $1,477,890 payday. 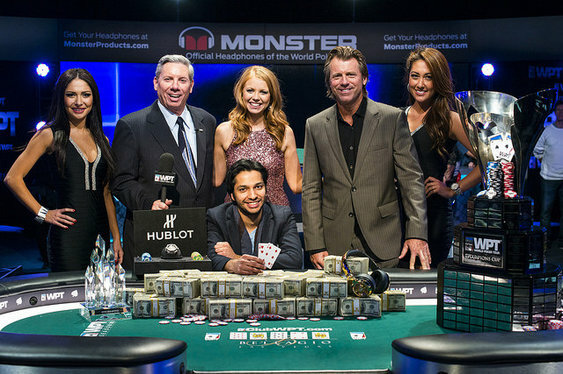 Charania joins Daniel Negreanu and Antonio Esfandiari in winning his second WPT crown at the the Five Diamond.